I'm going to be controversial. I think this was my favourite conference of this year. I know that's not trendy, and that Oracle-bashing is still a popular pastime. And I know I've also made a big deal about how much fun it is to meet people who program in different languages. But there is something very special about being surrounded by thousands of people from all around the world who use the same technology as you, some facing the same problems, some solving very different issues. Maybe it's because since I first spoke at JavaOne last year I've met a lot of people in this ecosystem - Oracle Java people, other conference organisers, Java User Group leaders, speakers and attendees from all sorts of places - and seeing many of them in one place is fun and makes you feel like you're "home". I'd be sat in the Taylor St Cafe area and people would sit down and hang out with me. I'd be hiding somewhere trying to write a presentation and people would say Hi. I'd be separated from the other LJC guys while I grabbed a glass of water and someone would stop to chat. It was awesome. I even managed to get a tiny bit of work done between socialising. Doing two conferences back to back is exhausting. If I do it ever again, I really need to optimise my travel between them (i.e. not fly from St Louis to London and then to San Francisco 48 hours later). Especially if I have two conferences back to back, but almost definitely as a rule, it's best to have the materials for presentations complete before the conference. I probably would have enjoyed myself even more, and definitely had a chance to see a lot more sessions, if I hadn't had one presentation to finish. Presenting four sessions in one conference is extremely challenging. Technically I only had two full-length presentations (the Disruptor presentation I've done at OSCON/GOTO/QCon etc and my Technical Approach to Women, which was more like a very structured BOF), a short 20-minute talk and a panel. But I think one full-length presentation and a couple of other bits is probably a much more sane amount. Especially given 1) and 2) above. So I didn't get a chance to really see many sessions. I'm sure the blogosphere will be full of good summaries of them, and they will be available for free via the schedule builder (audio and slides only). 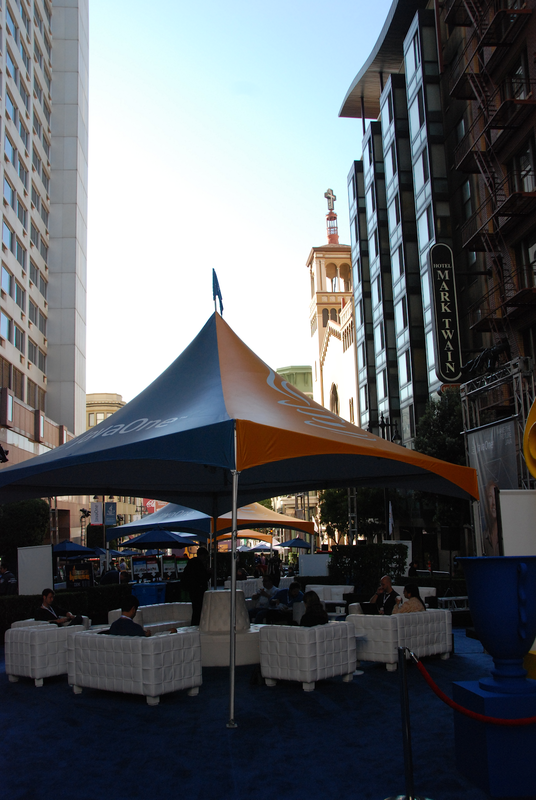 There will be a bunch of other blog posts mentioning the inconvenience of having it in three hotels, the poor suitability of some of the rooms, the difficulty of sharing San Francisco with Oracle Open World, the mediocre food. But you don't spend the money to fly halfway across the world to San Francisco for the crappy box lunches. You fly here to meet - face-to-face - some of the people who created Java, those who are steering it now, and the community that continues to make it relevant and fun. 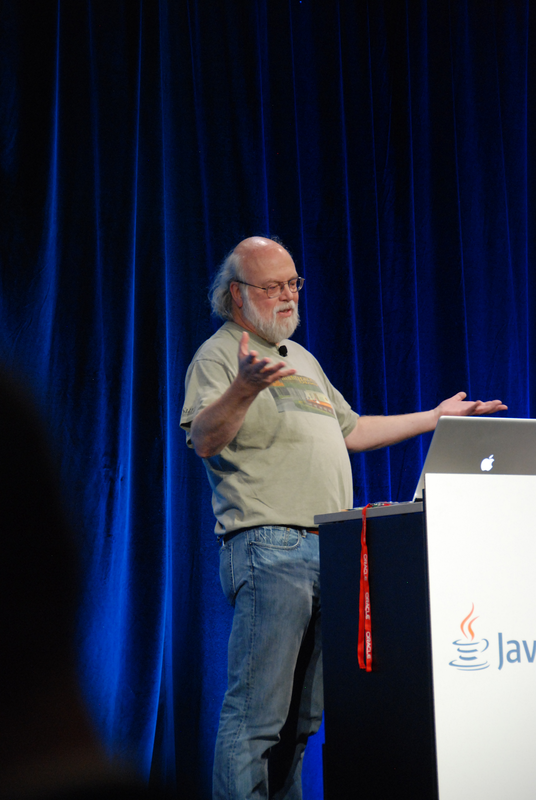 James Gosling talks about Robots! I already mentioned the technical keynote in my summary of Sunday, but I forgot to talk about Dr Robert Ballard's section, which is crazy because it was so inspiring. What I got out of that was how much fun technology can be, and how kids are really ready to be amazed and engaged with science and technology, provided you get them young enough. I also really loved that the photos of all the scientists showed great diversity, something he seems to take very seriously. His comment was "A child needs to see their face 20 years out to know they can play in the game. Don't sell science, sell scientists and engineers". The point I took from that was that by focussing on "science" and "technology", we could be losing people - by showcasing the people, the talent, the passions, we are much more likely to engage children. And I think that stands for adults as well. And this nicely fits the message I was trying to get across in my session on Wednesday (which I know I've already blogged about) - it's dead important to address the failure points when it comes to diversity, but I think we forget to push the positives - the reason we don't understand why some groups of people are under-represented in technology is because we all love being here, it's a great industry to work in. I'd love to see our passions more widely showcased than simply at conferences where we're a self-selecting audience. 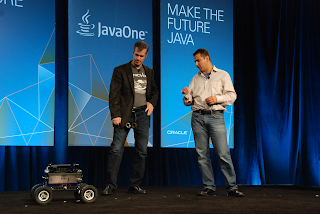 Not only was this a great JavaOne for me personally, it was a real triumph for the London Java Community. Last year there were only two of us here, and Martijn was working hard to introduce me to the other JUG leaders and the people on the JCP committee that we were going to be working with over the next 12 months. 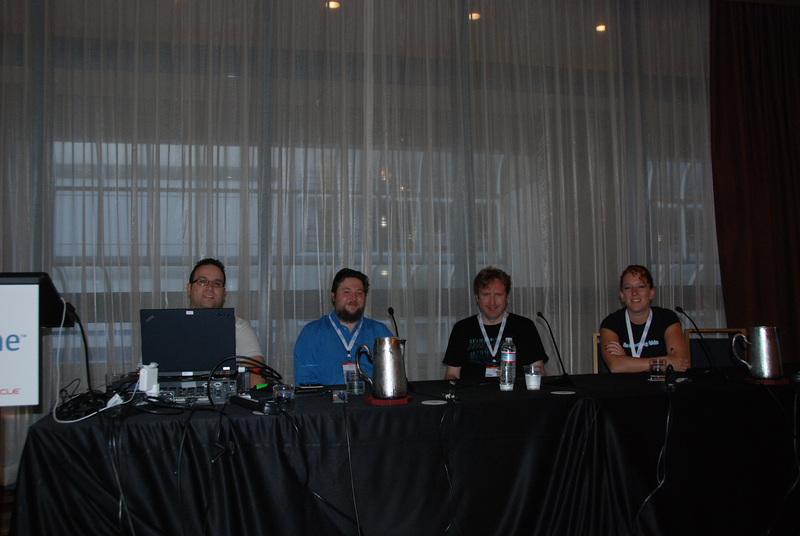 This year, there were five of us here, spreading the word about our work as a member of the Executive Committee of the Java Community Process (the Java standards body), primarily our Adopt a JSR program. We also wanted to talk to a load of people about the Adopt OpenJDK program as well, we've found lots of developers are really keen to develop the language itself, Java at the fundamental level, and we really want to help bridge the gap between the guys who work on the OpenJDK project and the developers in the community. But all our hard work over the last year, kicking off these programs and working with other user groups and Oracle to really harness the power of the community, has been recognised. We've won not one, but two awards - woohoo! Fame, glory, girls/boys, money etc await us! Well, not quite... but it's certainly nice to be the "Award Winning London Java Community". 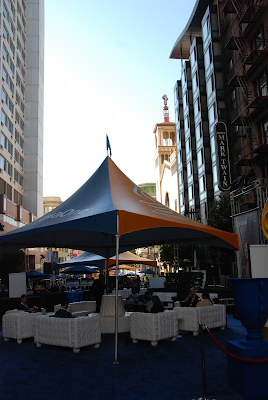 So, a really great JavaOne. I'm not sure, if I'm honest, who reads my summaries of conferences - I know lots of people do read them, but I don't know if that's those who went to the conference or those who would have liked to have gone, or those who don't know what it's like at conferences. 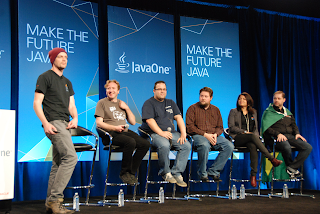 You want to meet other Java developers from around the world - whether you want to find someone with the same problems as you, or want to see different issues that face people. 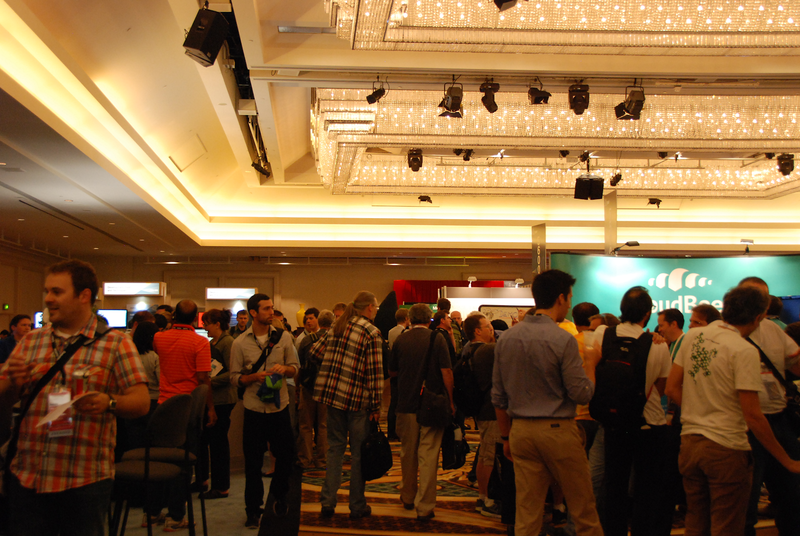 You want to see the Power Of User Groups! Oh there's millions more, and even if you only tick one of those reasons, I personally think it's a great way to get a better understanding of the language we use every day as developers.